August 1, 2016 By Elizabeth Lindemann 2 Comments / This post may contain affiliate links. Here it is folks- your solution for feeding a crowd, for busy weeknights, and for a family friendly dinner that takes only 10 minutes of prep. Oven Baked Steak and Chicken Fajitas! 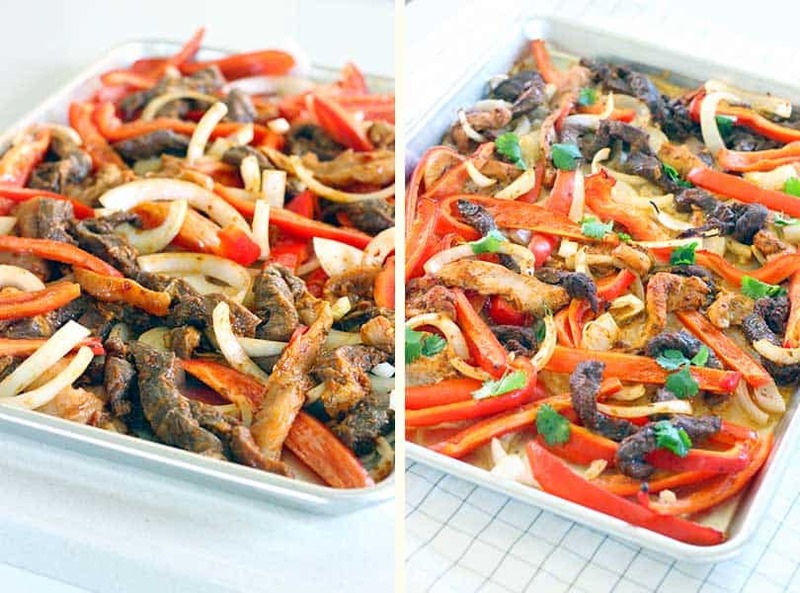 These fajitas are packed with flavor and take very little effort: no more than slicing some meat, marinating it in an easy spice combination, tossing it with peppers and onions, and baking. You can even make it in advance and freeze it for an even EASIER dinner! 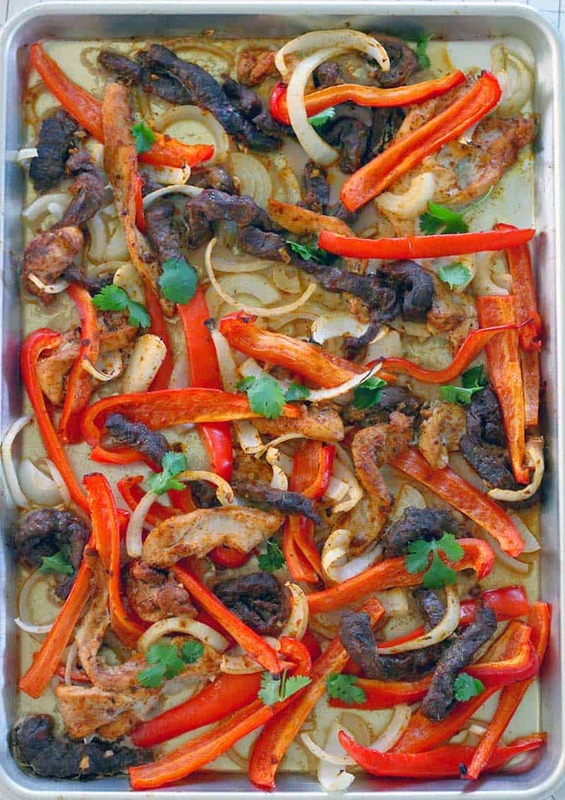 The meat marinates in a combination of spices, olive oil, and lime juice. The lime juice is key here: the acidity in it helps tenderize the meat, making it super tender (even if you use an inexpensive cut of beef). It’s steak… AND chicken! Meaning your family or dinner guests can choose for themselves which kind of meats they want- or pile both in their plates (which is what I do). And because of the lime juice marinade, the meats can cook together for the same amount of time without drying out and becoming too tough. The FIXINGS. Guacamole or avocado, salsa or hot sauce, pico de gallo, sour cream, cheese… the world is your oyster. And putting out a wide array of fixings makes it a fun dinner to assemble for both kids and adults. It’s inexpensive (I just love a bargain). My favorite way to eat fajitas is to put them on a warm flour tortilla and top with guacamole, sour cream, salsa, and fresh cilantro. You can use corn tortillas, large wraps for burritos, or even rice as a base for the meat, peppers, and onions. Or for a Paleo/Whole30/low carb option, serve over cauliflower rice. to make this, and to roast literally anything you want. I have two and they are the ONLY baking sheets I will EVER use. They are super sturdy, so they don’t buckle when the temperature changes (it’s the scariest thing ever when hot oil splatters when your pan buckles!). 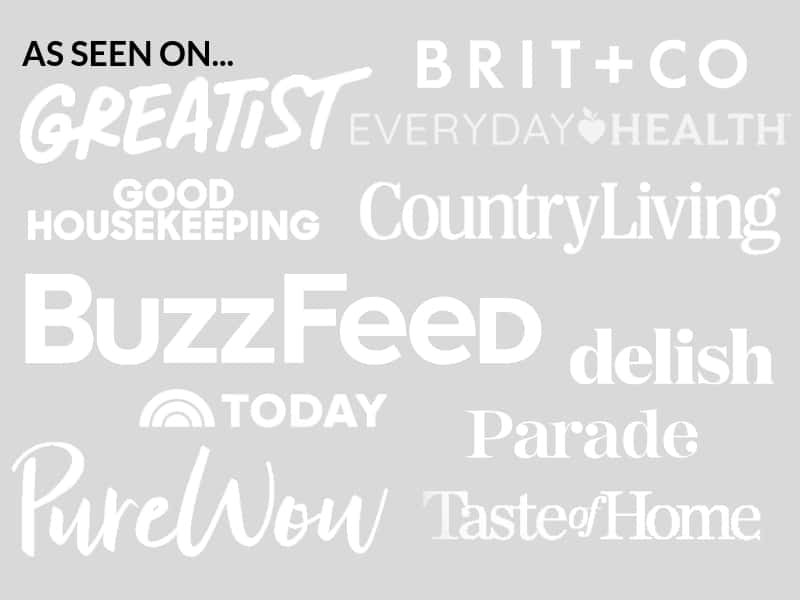 They conduct heat well to make sure that your food is well cooked on the top and bottom, and they are really good at being non-stick, even though they don’t have any non-stick coating (it’s all natural!). PLUS, they are only around $12! Go get one! 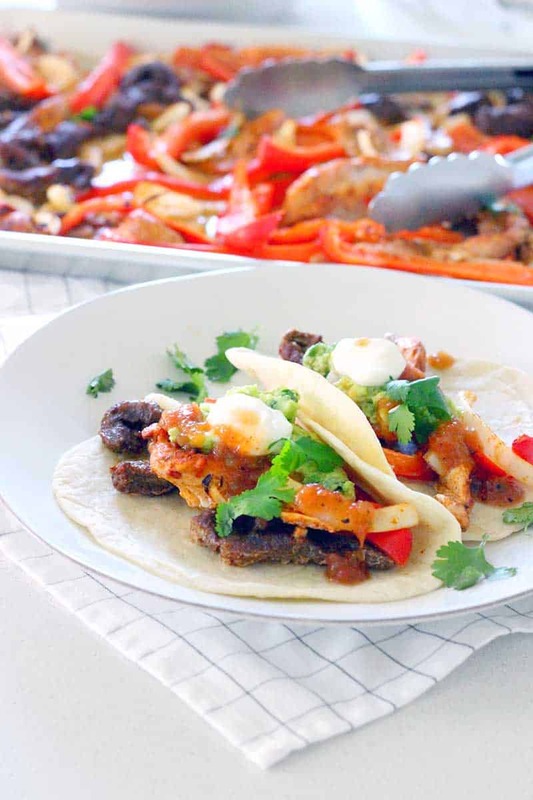 These oven baked steak and chicken fajitas are tender, bursting with flavor, and are an easy, no-fuss weeknight dinner the whole family will love! 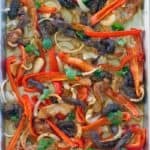 On a rimmed baking sheet, spread the steak, chicken, onion, and peppers out. Mix together. Bake at 350 degrees for 30 minutes (or until meat is cooked and veggies are beginning to brown). Serve meat and peppers on tortillas or brown rice with guacamole, sour cream, hot sauce, pico de gallo, and/or salsa and garnish with fresh cilantro. Love the sizzle! Steak and chicken fajitas, two for one!